Based at the Chicago-Kent College of Law, the Oyez Project is a multimedia-based U.S. Supreme Court tool created in the late 1980s with the support of many researchers, students and academics mainly from Northwestern’s Learning Technologies Group. The project receives a support grant from the NSF, the National Endowment for the Humanities and Google, but is also supported by private firms and foundations. 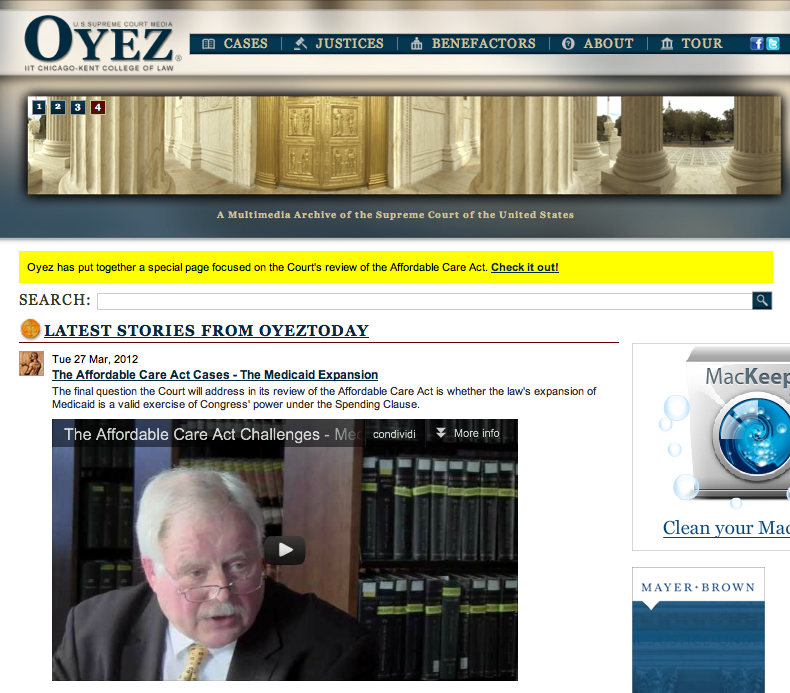 Conceived as a demostration of the power of multimedia integration with serious academic content, OYEZ gives access to more than 7,000 hours of Supreme Court audio (all distributed by a Creative Commons license), including session records since 1995. It also contains abstracts for all leading constitutional decisions of the Court, authoritative oral arguments in streamed media format. The database presents a list of all Supreme Court justices as well as a list of cases sorted by subject. For each case a short abstract, a summary of the proceedings and a clip are provided. Along with frequent updates, the site hosts a blog with latest information on specific issues and a calendar that reflects the Supreme Court’s most recent sessions. The website is accessible for free and also offers a virtual reality tour of the Supreme Court building. A well designed and complex website, with some improvements in crucial areas for new users, such as help, FAQ and comment sections.